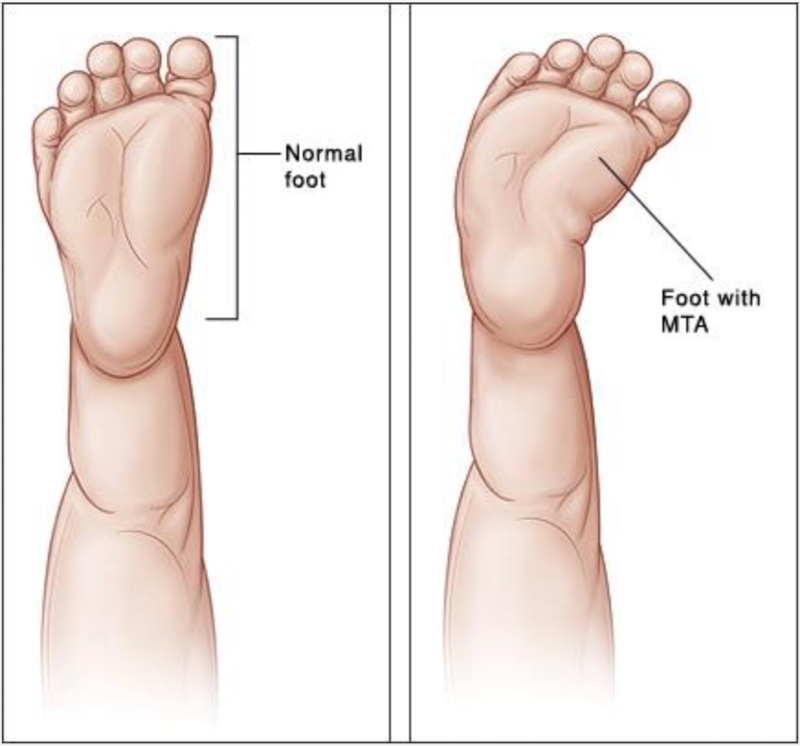 A deformity of the front part of the foot in which all of the metatarsals are positioned to the inside of the foot. Hyperactive muscle (tibialis anterior, tibialis posterior muscle or abductor hallucis). Abnormal bone or joint structure. The front half of the foot is turned in relative to the back half of the foot. Foot may turn up and in, causing a crease of skin on the inner arch. Foot is shaped like a “C” when viewing it from the sole. May be associated with rotational problems of the lower leg (internal tibial torsion). Excessive space between the first and second toes. 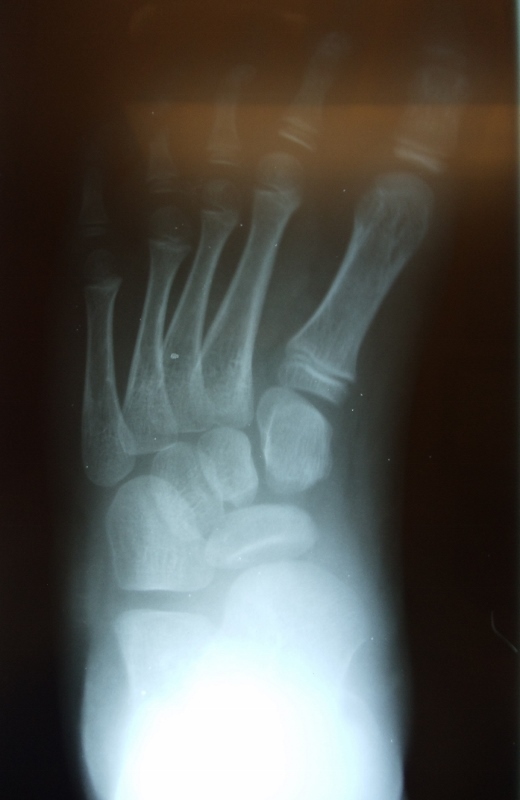 Prominent bone (fifth metatarsal) on the outside of the foot. May be associated with the curvature to the heel bone (calcaneal varus). Juvenile bunion and hammertoe deformities. Lateral drifting of all the digits as the tendons on the top of the foot pull the toes to the outside. Stress fractures to the outside bones in teenagers and adults. Arthritis in adults due to the abnormal joint positions. Identify the level of the problem (foot, ankle or leg) and the foot’s flexibility. Corrective shoes and occasionally night splinting. Casting of the foot and leg to straighten the position of the foot and in some cases the lower leg. Prognosis is excellent if the condition is treated early. Below is an x-ray image of Metarsus Adductus where the long bones of the foot, the metatarsals. that correlate to each toe are diverted at the level of the midfoot inward leading to a C-shaped foot. Pics Below of Serial Casting for a Cavovarus foot that is reducible in a 5 week old.